The U.S. Nuclear Regulatory Commission stipulates that employees should not be exposed to more than 1,250 mrem of ionizing radiation dose per quarter, or 5,000 mrem per year. That number drastically changes for pregnant women — a pregnant woman should only be exposed to a maximum of 500 mrem during her entire gestational period. 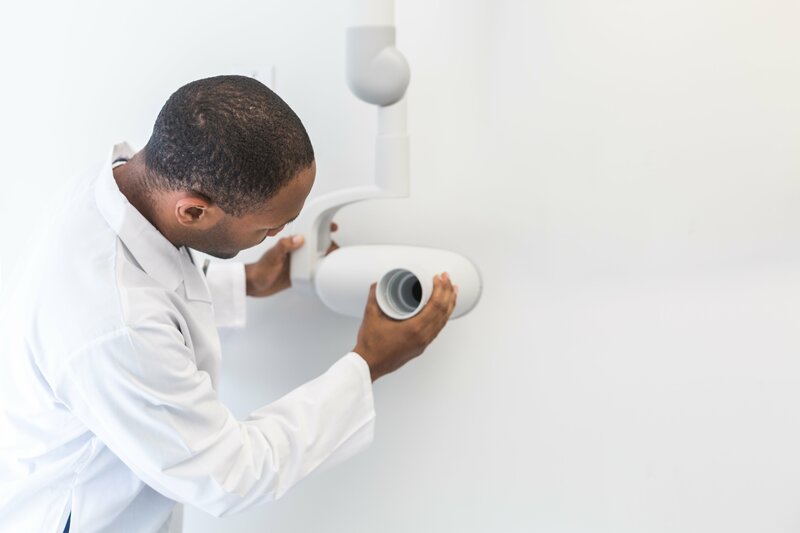 While dental X-rays emit relatively low levels of radiation compared to other types of imaging procedures, radiation dose can add up — particularly if the dental office is very busy. Time – Limit exposure time. The longer a person is exposed to radiation, the higher the risk of adverse effects. Distance – The farther away people are from the source of radiation, the less their exposure. Generally, hygienists should stay at least six feet away during X-rays. Shielding – Hygienists should ideally walk out of the room and stand behind a lead wall to protect themselves from exposure. Dental staff should wear a personal dosimeter when they are working. The Instadose+TM digital dosimeter is smarter dosimetry technology made simple – allowing hygienists and other dental employees to immediately and wirelessly “read” their dosimeter to see if they are limiting their radiation exposure and staying within recommended dose levels. Information collected by the Instadose+ smart dosimeter can be read on-demand to determine daily or monthly exposure levels by accessing the information via a computer or mobile device. The built-in Bluetooth capability eliminates the need to collect, process and distribute dosimeters providing a much smarter way to manage staff radiation dose levels. Studies show overexposure to radiation can lead to cancer and other serious health problems. Therefore, best practices to eliminate exposure should be employed by all staff and effective monitoring of radiation dose levels is the smartest way to ensure safety.